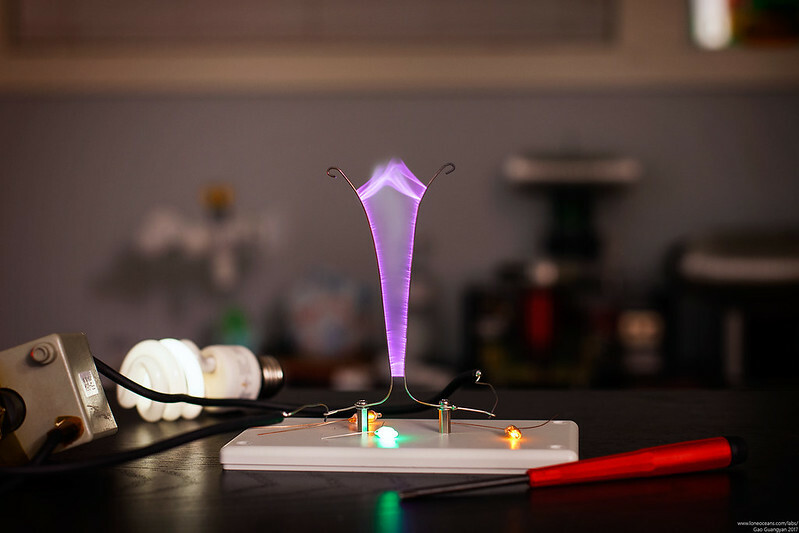 Creating high voltage electrical sparks with a television flyback transformer is a fun beginner project for many electronics hobbyists. In fact, the first few HV projects I ever worked on were flyback-drivers of different sorts (outlined in this page here) - their simplicity and ease of construction makes them great introductory projects into the world of high voltage electronics. Common flyback driver designs include the popular single transistor driver, as well as the ubiquitous and powerful Mazili ZVS flyback driver. Kits based on those two designs are widely available on the internet and on eBay. However, I wanted a driver which was even more robust, and capable of driving flyback transformers at high power levels, yet still being reasonably straightforward to construct. 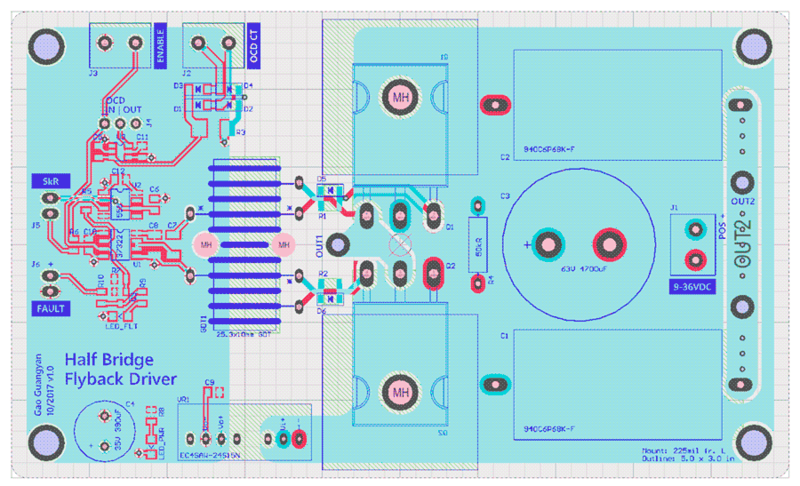 This page outlines the design and operation of a half-bridge flyback driver, and describes how you can build one yourself too! If you are unfamiliar with flyback transformers and what they are and how they work, please feel free to read my earlier page on this topic here, where I describe their method of operation in detail. 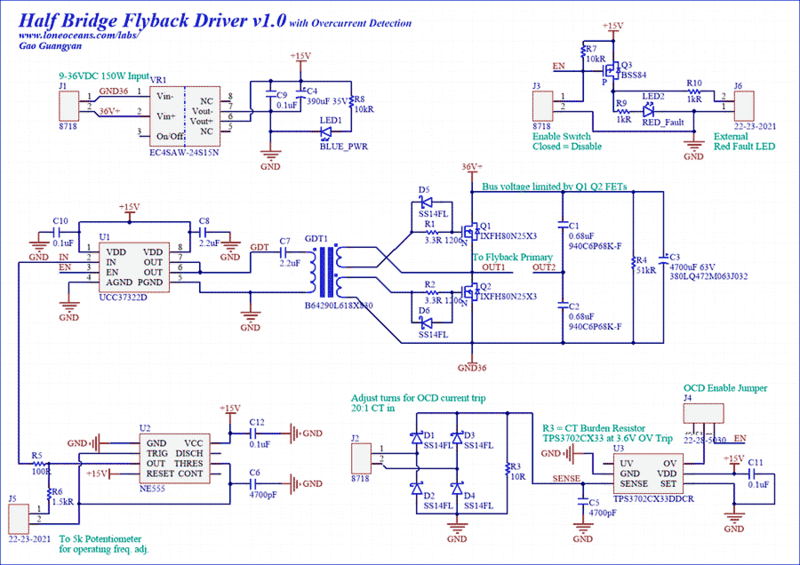 This page will focus primarily on the design and construction of a half-bridge flyback driver. 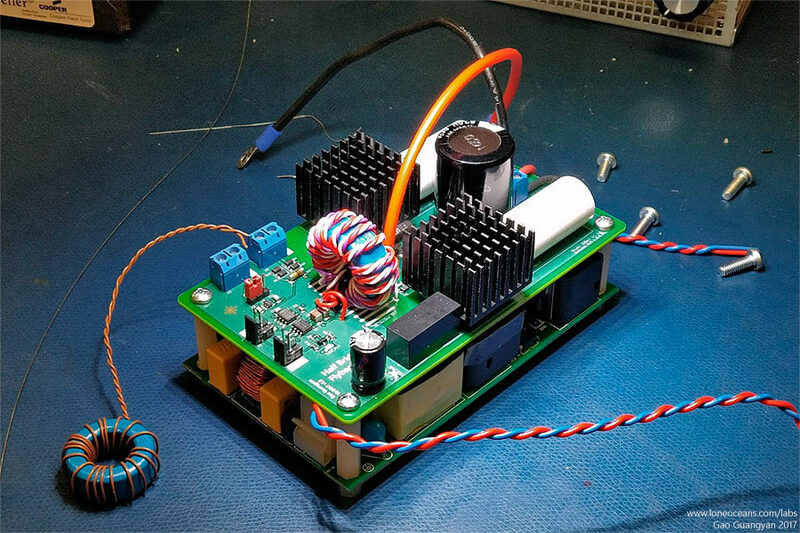 The completed flyback driver (with a conservative current limit and driven with 36V on the bus) was tested up to a measured 120W input power for extended (many minutes) of continuous run time and remained all cool to the touch. I have no doubt this driver will do just as well as a few hundred watts - more to come soon! For result, please scroll down to the bottom of this page. Thanks for reading and please be safe if you are attempting the project described here! Based on the above guiding principles, I adopted a half-bridge driver topology driven by a fixed frequency oscillator. I could have gone for a more powerful full-bridge inverter, but using a half bridge saves components and should be sufficiently powerful enough. In addition, I decided to go with all discrete components (i.e. not using any programmable ICs) such that hobbyists can easily replicate this project. Finally, I also wanted some sort of basic protection for overall longevity and robustness of the system, therefore I implemented a simple over-current detection which cuts off power when a threshold current is exceeded. Ironically, despite the fact that this half-bridge driver will be driving a flyback transformer, it will not actually drive it in typical 'flyback - mode'. Instead, this driver topology will operate more akin to a regular, albeit high frequency, transformer. Specifically, 'flyback-mode' operation refers to a switching topology whereby the primary and secondary conduction cycles are non-overlapping. 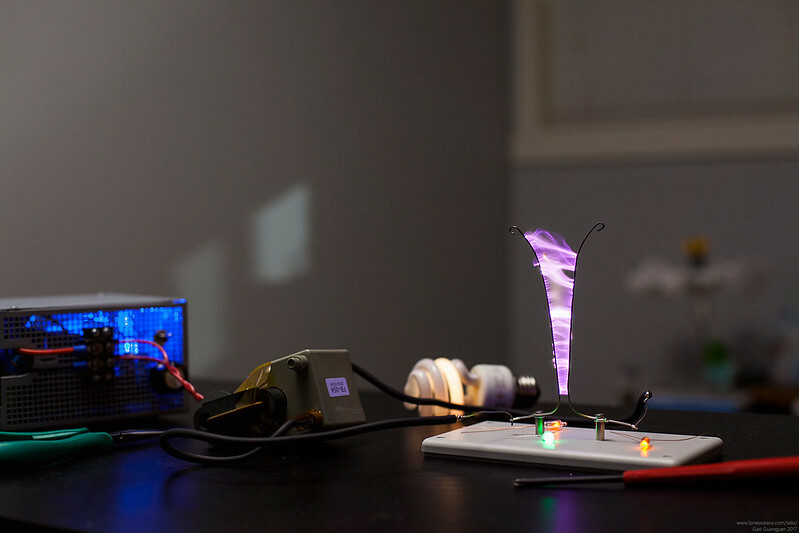 In the flyback mode, the primary coil essentially acts as an inductor, where energy from a primary cycle is stored in the magnetizing inductance of the inductor, and then released to the secondary coil. Driving the transformer in the manner described on this page therefore is not a typical 'flyback-mode' drive. However, it still achieves our goal of producing nice arcs from a flyback transformer. One popular feature which people may be interested in, is to create a 'singing' arc. In those instances, the driver modulates power into the flyback transformer based on an audio input. I decided to omit this feature from this particular project, focusing instead on simplicity. However I do plan to create a much more advanced driver in the future with this capability (and more!). The Halfbridge Flyback driver system including design, schematics and layout are available for use under the Creative Commons License. This is how my flyback driver works. Power is supplied via J1 which, in this specific design, can range from 9 to 36VDC. 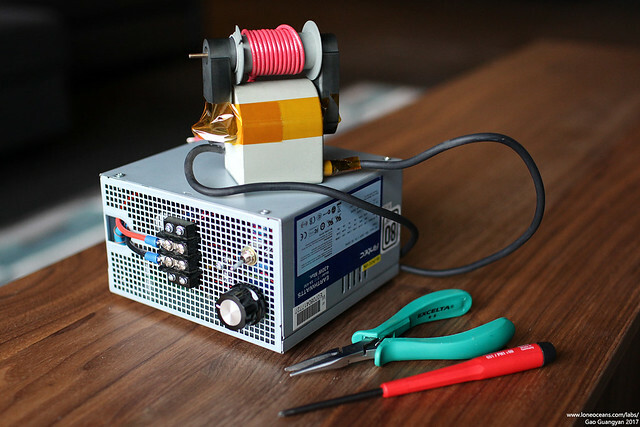 This is the main power supply for the half-bridge inverter, and also powers the voltage regulator generating the 15VDC rail which is used for the other parts of the circuit. Note that the range of 9 to 36VDC is simply the input voltage range to the small DC/DC converter (VR1) - you could certainly run the driver at even higher voltages, limited by your main switching MOSFETs, but then you will have to find another way to generate the 15V rail for the 555 oscillator and gate drive. Note: To generate the 15V rail, I'm using an off-the-shelf 5W DC/DC converter. You can also replace this with a standard 7815 (TO-220) voltage regulator. However those typically have a maximum 35VDC input and will get very warm with >20V in (heatsink required). The 7815 also has a 2V voltage drop at 1A I_fwd, so you will be limited to ~17 to 35VDC input. For ultimate flexibility from the main bus, the 15V rail can instead be generated from another external power supply. Next, a generic 555 timer (U2) is configured in the standard astable oscillation mode with a duty cycle fixed at 50%. The operation frequency is set by R6 and C6, as well as an external series potentiometer (5kR), connected to J5. In the schematic above, this allows setting an operating frequency between about 23.4kHz and 101.3kHz. This square wave is fed into the input of the UCC37322 (U1), which is a powerful 9A MOSFET driver. Note: As shown in my schematic above, the 555 generated frequency can be calculated as freq = 1 / (1.4 * (R6 + J5)*C6 ) where R6 = 1.5kR and J5 = the value set by the potentiometer and C6 = 4700pF. Another example is using the same 5kR potentiometer together with C6 = 3.3nF, R6 = 2.7kR, giving us 80.2kHz (when the pot is 0 ohms) to 28.1kHz (5k ohms) operation - I use these values in my final build. Care needs to be taken such that the GDT does not saturate at the lowest operating frequency. 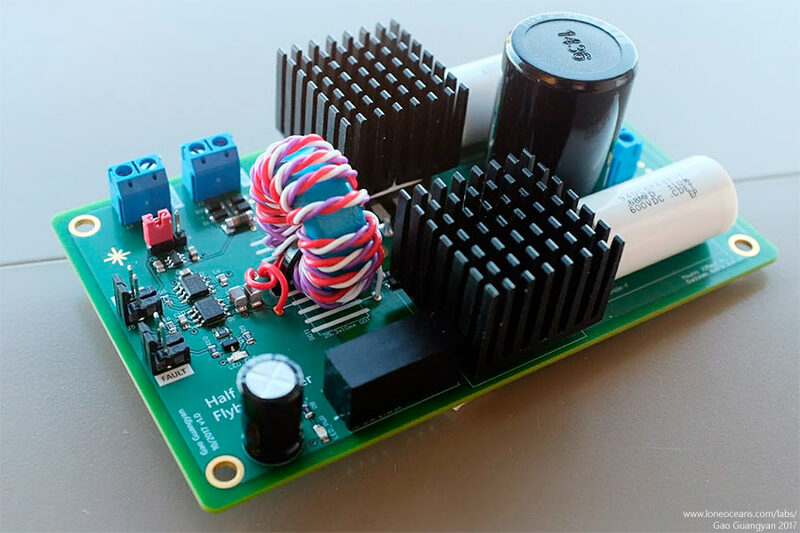 Instead of driving a FET directly, the UCC37322 FET Driver drives a hand-made Gate Drive Transformer, which then drives the gates of two power MOSFETs. Using a 1:1.6:1.6 turns ratio (for example 10 primary turns and 16 of each secondary turns), this generates a +-12V gate drive signal across the gates of the power MOSFETs (from the +15 to 0V across the primary winding of the GDT). Please read below to see how I made my GDT and what cores you can use. The maximum input to the half bridge is limited mostly by the choice of MOSFET used. For example if the popular and cheap IRFP260 MOSFET is used, something up to ~150VDC can be used. In my case, I've opted for a more expensive but better MOSFET (IXFH80N25X3 250V 80A) which should be good for up to ~180VDC or so (though in practice 36V will produce good results, and is already more than likely to be able to fry most flybacks!). Likewise, the DC power supply used needs to be sized accordingly. I've opted to use a 150W 36VDC DC power supply for this project which should be more than enough for most applications. A simple over-current-detection (OCD) scheme was also implemented. This is described in the bottom-right block in the schematic above, and can also be omitted if you do not want over-current protection. J4 allows keeping the OCD circuit in system or out of system. 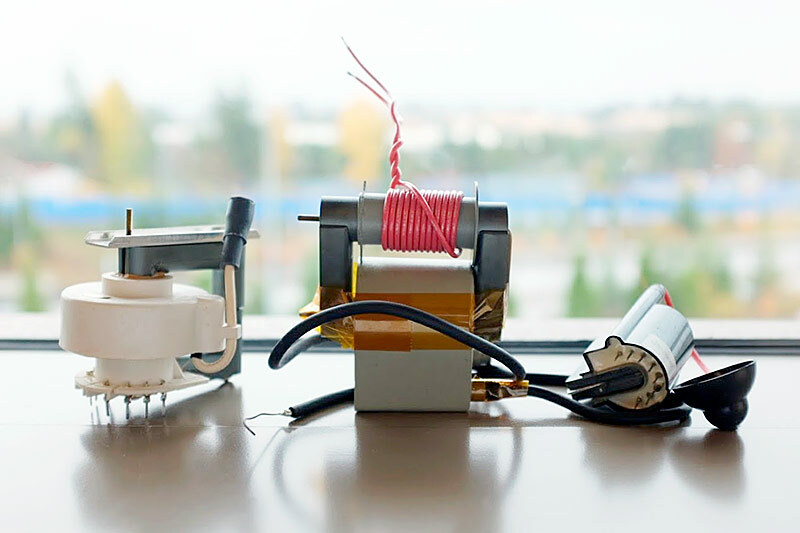 To achieve OCD, a home-made current transformer (CT) was created which senses the half bridge output current. This was constructed using a 20:1 turn ratio CT. The signal from this CT is rectified through a bridge rectifier (made from diodes D1-4), and burdened by load resistor R3. The voltage across this is sensed via a Overvoltage Monitor IC (TPS3702CX33DDCR), which is essentially an integrated comparator. In this case, the trip voltage for my particular choice of IC is 3.60V. When the voltage across the burden resistor exceeds 3.6V, the TPS3702 IC's OV (over voltage) pin is pulled low (open drain). As a result, with the current setup, the peak current limit is set conservatively at 7.2A. To increase the current limit, either increase the number of turns on the CT, or decrease the resistance of the burden resistor. For the record for this particular IC, the propagation delay for an over-volt event is 35us, and the time for re-enabling is 19us when the voltage falls below threshold. Hysteresis is 0.55% for the X part I used, with OV thresholds 3.60V and 3.43V. Having such a low current rating is a little conservative, but together with our 80A MOSFETs, we should hopefully see extremely rugged operation and it should be pretty hard to blow up this driver (touch wood!). With the design complete, I decided to do a quick lunch-time layout. One thing I thought I wanted to do was to fit everything into a standard ATX computer power supply box. I decided to go with a 36VDC 150W DC/DC switching power supply as my main power source, and I managed to find one which had a 5x3" footprint. In order to make mounting easier, I used the same footprint as the basis for the board layout so I could mount everything into the box in a tidy way (on top of each other). After about an hour or two of layout, I got something I was quite happy with. 5x3" is a lot of board real-estate so layout was no problem at all. The 36V rail features a laminated bus structure to reduce switching spikes by keeping the power loop inductances low. The main power input (from the 36V DC power supply) comes in from the right into the 5mm screw terminals (J1). This is how it looks like in 3D. Most computer ATX power supply boxes come conveniently with a power switch, IEC input jack, and a 12VDC fan. However we will not have any 12VDC supplies, so I replaced it with a 80mm AC fan connected directly to mains instead. This fan was subsequently changed out for a 12VDC fan powered by a 36 to 12V 1A small switching regulator, thus allowing true universal input operation for the entire unit. 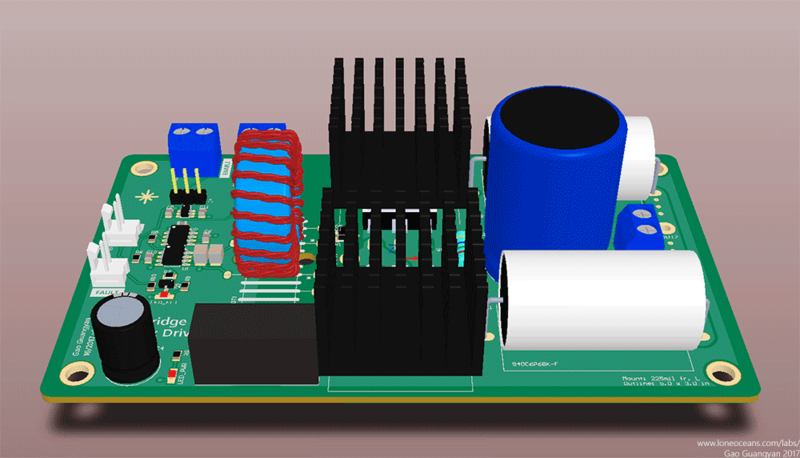 This fan will provide cooling for both the power supply and switching MOSFETs which have their own direct-mount heatsink. Having separate heat-sinks allows for a direct thermal contact to the transistor package casing and should improve thermal performance (though probably unnecessary). Not pictured here (or on board) is the current transformer used for over-current-detection. 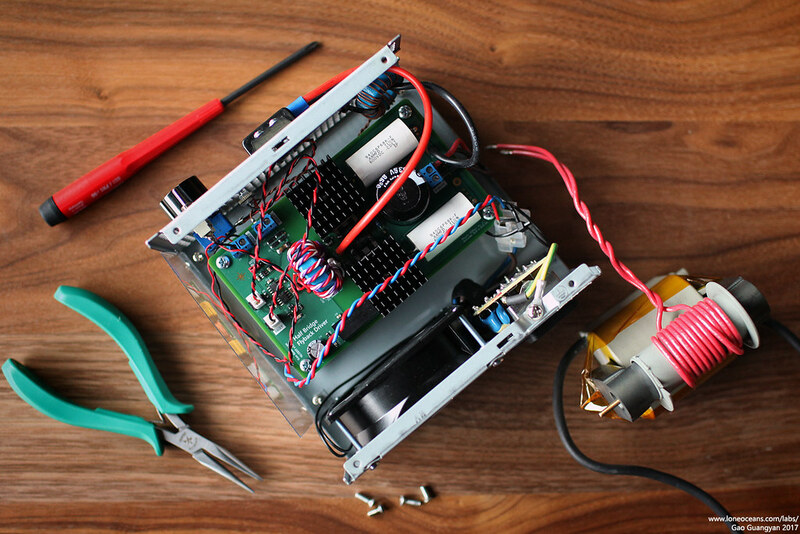 The Gate Drive Transformer is a self-wound GDT and cable-tied to the PCB via the 2 drilled holes. After waiting for a while for the PCB and components to arrive, I was able to assemble the board together. There are not too many components so the driver was assembled fairly quickly. The two things that I had to do an extra little bit of work was to tap and drill holes in the two heat-sinks for the transistors - (these are very cheap 28 x 28 x 20mm square heatsinks from Aliexpress / Ebay), as well as to wind my own GDT. For those not familiar with GDTs, GDTs are transformers which allow generating isolated gate drive signals without requiring isolated power supplies. They work great in this half-bridge design whereby the first of the secondary winding drives the lower FET and the second secondary winding drives the gate of the upper FET. In order to generate the +-12V desired, I opted for a 12:20:20 primary:sec:sec ratio. The primary is driving at +15V to 0V, and with the 12:20 ratio should give us +-12.5V on the secondaries. It is critical to make sure that the GDT core does not saturate, especially when switching at low frequencies. I opted for a decent sized 1" diameter ferrite core (N30 material toroid made by Epcos / TDK and commonly found on Mouser or Digikey), and I twisted 3 strands of wire together (to reduce leakage inductance). 12 turns were wrapped around the core, then an additional 8 more for the secondary windings. Care was also taken to ensure that the polarity of the secondary coils were soldered in opposition (so we only have one transistor on at any time otherwise a dangerous shoot-through occurs when both transistors turn on at the same time!). I highly recommend verifying the polarity with an oscilloscope if you have the slightest doubt since this mistake will blow your board and transistors up. Likewise, the current transformer (pictured above made with brown wire) was wound using the same ferrite core as the GDT. 20 turns were wound on it. The number of turns can be changed in conjunction with the burden resistor to change the desired trip current. 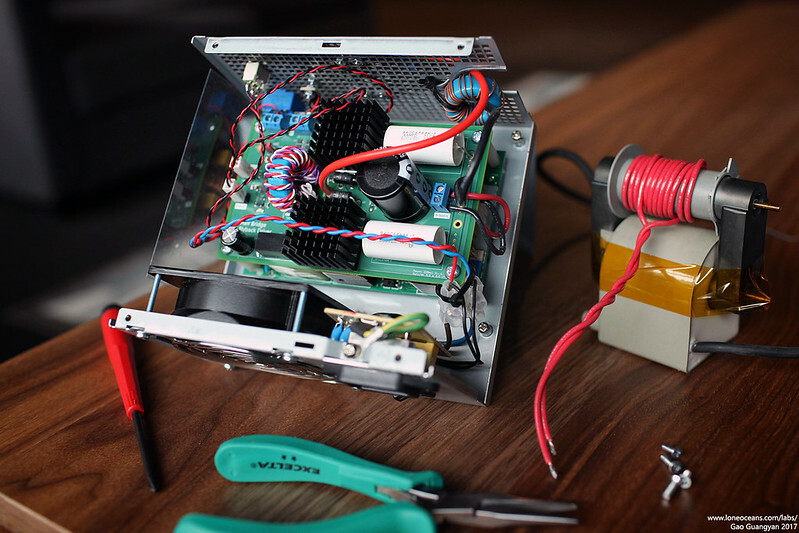 With the board assembled, it was then mounted on stand-offs on top of a 36V 150W AC to DC universal voltage power supply. Notice how I designed the PCB to fit perfectly on top. Finally, I placed all the components into a scrapped ATX power supply case. The case is ideal for projects like these because of their compact size, essentially no cost, and comes with a built in fan (I replaced it with a AC fan driven directly from the mains), switch and AC filtering, power receptacle, as well as a cable hole at the front! All that was required was for me to drill 4 holes into the bottom of the case. A barrier block was mounted at the front of the case, as well as the enable/disable switch, a bright red LED, and the frequency control knob. The driver is complete! � No diodes for true ac output. � No primary coils at all. � Large gap between secondary and primary for your own primary winding. I bought myself one! For reference, above is a photo of the Fiddy's Flyback (middle) with a F0241 flyback on the left and a KFS230867 (replaces Koyod HR 42020) transformer on the right which are traditional CRT flyback transformers. I did a quick weigh in and they weighed 352g, 668g (with the wire) and 140g from left to right! With the much nice construction (and lack of other secondary windings), this large flyback will be my main flyback of choice. I plugged the driver in and it worked first time around, both with regular flyback transformers as well as with the large custom flyback! Here are some preliminary results. For this first test, I created a very simple Jacob's Ladder out of two wires and hooked it up to a flyback transformer connected to the half bridge driver. The driver was fed with 34VDC, which drives a 12 turn primary coil on the flyback transformer. The result was some very beautiful arcs ranging from white hot (~30kHz), to beautiful long purple arcs (~42kHz with some resonant action going on). 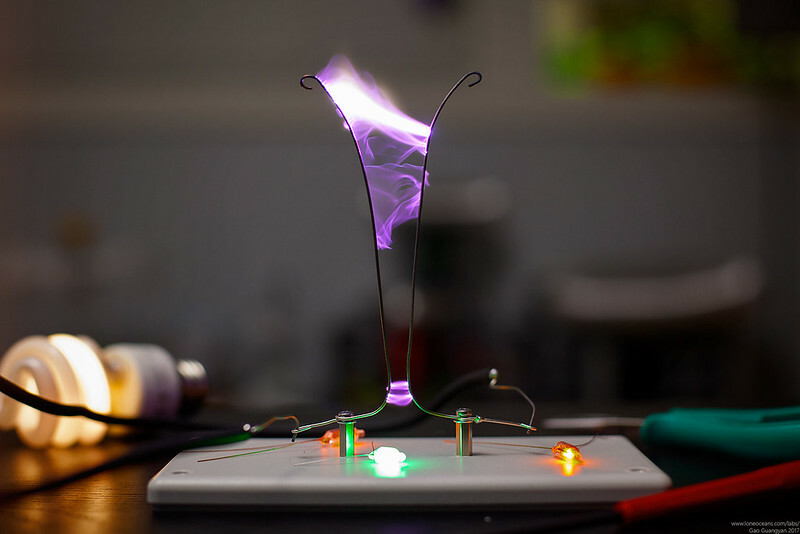 Due to the high operating frequency, the arc is very quiet and flame-like, dancing between the two wires in a mesmerizing way. In this preliminary test, the results were very good. The half bridge driver performed well showing really no signs of much heating at all despite a continuous run of around five minutes. The flyback transformer (windings and core) remained cool as well, with most of the heat being from the ladder itself. Power level was measured around 2A at 34V for a roughly 70W operation when arcs are drawn. Finally, I played around with various settings and drove this (and other) transformers with varying turns on the primary side (ensuring the cores do not saturate), and also did some power measurements. The OCD kicks in perfectly well, and when heavy arcs are drawn, the TPS3702 (with an at-best 18kHz propagation repetition frequency) comes into play and limits the current, often with an associated high squeal at the on-off OCD Frequency! Maximum power measured by a Kill-a-Watt into the arc (already excluding gate-drive and fan cooling) was measured at max to be about 120W when drawing hot 2" fiery arcs with no apparent heating of the flyback transformer or bridge. This is well within the 150W limit of the power supply and this should all make for very reliable operation! As usual, more to come soon and hopefully with much more power! Need a beefier power supply! Here are a list of links to other great hobbyists whose work I have learned from in creating this project. Many thanks to them for pioneering the way!